NOTE: Please view the recent Paddington updates further down the page! Nowadays, fashion advertising comes out before the product even hits the shelves. So too with Chloe’s Paddington beauty. Waiting lists for accessories that haven’t left the factory also is now as common as putting a pair of shoes on layaway. 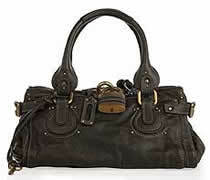 The Chloe Paddington has definitely superseded all those other bags which were once the it-bag. Balenciaga Lariat, the Fendi Baguette, or Gucci’s Jackie bag – they caused a stir in their day, but were somewhat accessible – even if you had to pull a some magic to get one. Not so for Chloe. This bag has sold out before a single one has made it to the boutique’s shelves. Due to the exceptionally high demand for this item, I suggest you don’t even start obsessing about this bag – unless you want to engage in absurd Ebay bidding wars over a genuine specimen with Paddington fanatics, of course. Apparently, each of the 8000 Paddingtons produced for Spring/Summer ’05 has been accounted for for months now. 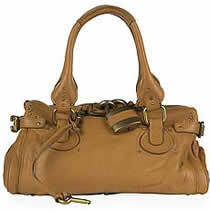 It is undoubtedly the perfect bag for girls who like the worn-in, slouchy look. 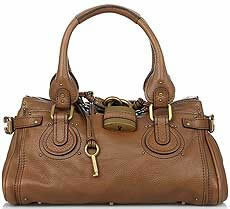 The practicality of the padlock on the 14″ handbag is questionable, it adds extra weight to an already pretty heavy bag. The zips on both sides are quite thick and not that easy to operate, especially when you’re carrying it on your shoulder. But if Kate Bosworth can do it, you can too. Try your luck at Net-A-Porter for a pre-order. 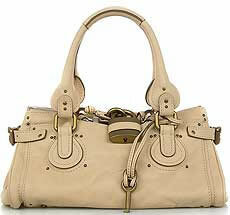 The ETA on the Chloe bags is still up in thin air, but more bags are expect in June/July. 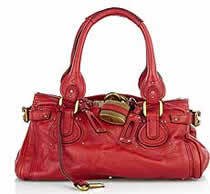 For those of you who are still after the popular and timeless Chloe Paddington, I have good news for you. Net-A-Porter has the Paddies available in many colors for immediate shipping for both Europe- and US-based customers!